Iberico Ham Hand Cut by knife by a master slicer is obtained from Iberico Ham bone-in since bone-in ham retains all the properties and tastes much better than the same piece of boneless ham. 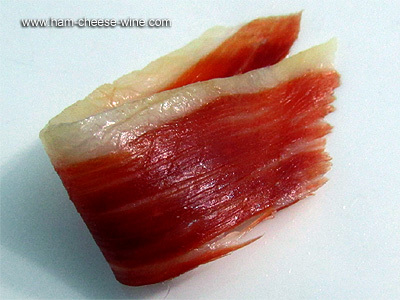 Once cut the iberico ham, the slices are packed immediately to avoid losing its properties and taste. 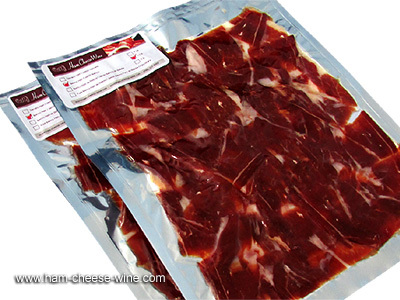 The product we are introducing, Iberico Ham Hand Cut by knife is very practical option for consuming at home, keep and open the package whenever you want and share it with friends and family in pleasant meals, trips, picnics or breakfast. Furthermore, with this option you don’t have to worry about cutting a whole ham, neither finding the materials to do so nor learning the skills required to cut and enjoy a delicacy such as Iberico ham. 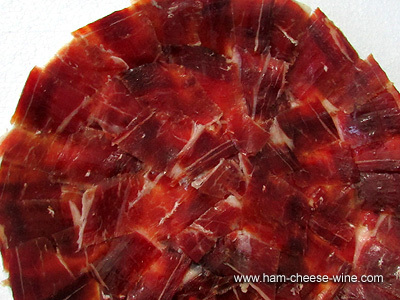 This product is sent to you, hand cut by a ¨Maestro Jamonero¨ just ready to be consumed. 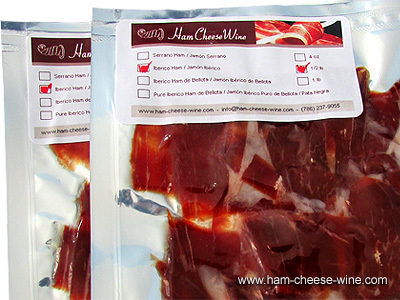 The packet of iberico ham hand cut by knife by a master slicer contains the different parts of the ham (the thicker part, the thinner part, the tip, the stifle). This is very important, as you will enjoy four different flavors within the same packet because our master slicer will always try to get the best of every piece of Iberico ham. This product is vacuum packet and sealed for better conservation in packets of one pound then delivered within two business days so the product retains all its nutritional properties. The cut made by hand of an iberico ham is closely related to the taste of this exquisite product, that’s why the experience of the master slicer is so important. 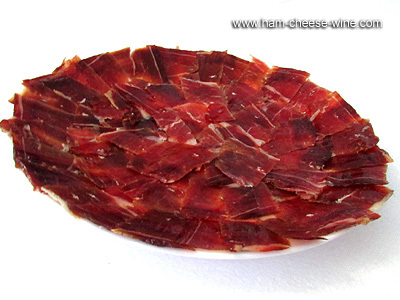 This product is made possible only by mixing knowledge; skill and practice of the “Maestro Jamonero”. 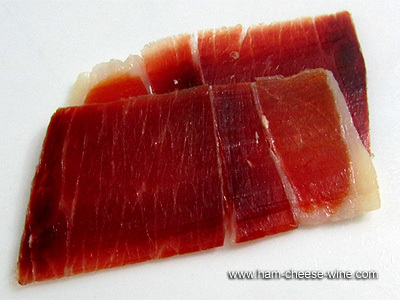 It is only by testing the slices of iberico ham hand cut by knife when you can compare hand cut ham with mechanical cut. When cutting the iberico ham mechanically, the speed of blade rotation burns the edges of slices, losing most of its distinctive properties, aroma and flavor. concentrated in bone-in hams. That’s why our iberico ham hand cut by knife by our master slicer always comes from a bone-in ham. Moreover, Iberico ham hand cut by knife has an intense aroma with a soft, sweet and quite salty taste, as well as a nice texture to the palate. On the other hand, iberico ham boneless must be consumed in a few days otherwise; it oxidizes and dries, losing its properties almost completely. If your goal is to properly savor a slice of ham cut by hand, is the advisable to take the package out of the fridge and let the package acquire room temperature. Remove it and give it enough time so that the ham can sweat, this will be one of the requirements to be able to taste the product while its flavor reaches its maximum intensity. much more affordable than buying the whole piece of Pure Iberico Ham. In addition, this product hand cut by knife and vacuum packed is delivered to your door through the postal service "Second Day", with only two days of delay so that your order will always arrive fresh and with full warranty. Iberico Ham Hand Cut by knife by a “Maestro Jamonero” provides customers with the possibility of buying small packs with slices carefully selected with unique taste and aroma in the world. It is considered as a tasty food by the most demanding palates. Furthermore, it is an excellent choice to give a present to your friends or family. It will be appreciated, that’s for sure, Vacuum packaging allows you to delight in a more comfortable way the Iberico Ham Hand Cut by Knife as it may be consumed for a longer time ( between 60 and 90 days, (while the vacuum is in perfect conditions ) regardless of weather conditions, it is the right product for long trips . We should keep in mind this iberico ham we are introducing today, now hand cut by knife by a master slicer, besides being a pleasure to palate, it has beneficial effects on your health. Iberico ham is an antioxidant and has a highly content of vitamin E. The consumption with tomato reinforces beneficial effects. The quality of the Iberico ham fat is invaluable, predominating the oleic acid (with levels over the 50 %) characteristic of olive oil. This help to increase HLD (good cholesterol) in blood while reduce LDL (bad cholesterol). 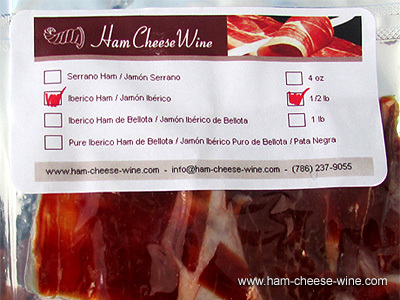 Ham Cheese Wine now brings you the best Iberico Ham but this time hand cut by knife with full warranty. Our company was created by Francisco Carrasco; professional “Maestro Jamonero” licensed from Spain and settled in Miami, Florida, United States. His experience of over 25 years as a professional “Maestro Jamonero” guarantees you that this Iberico ham hand cut by knife will satisfy the most demanding palates.